MAFCO’s two goals in each half goals were enough to hand Blue Eagles of area 30 their most painful defeat of the season on Saturday at Chitowe ground. MAFCO were coming from a 2-1 victory last week against Airborne Rangers in the super league where as their counterparts Blue Eagles were coming from a 1-0 win over Silver Strikers on the Standard Bank knockout cup. MAFCO move to second on the log table. It looked to be MAFCO’S day as the soldiers were pressing hard from the start of the first whistle and it was not a surprise to see the Salima based soldiers taking a two goal lead in the first half. Come the last half of the match MAFCO continued from where they stopped from and punished Blue Eagles with two goals to make the game beyond Blue Eagles’s reach. The boys from police area 30 pulled a goal back and the game ended 4-1 in favor of the Salima based soldiers. MAFCO has moved to second on the log table with 31 points where as Blue Eagles has moved to position 4. 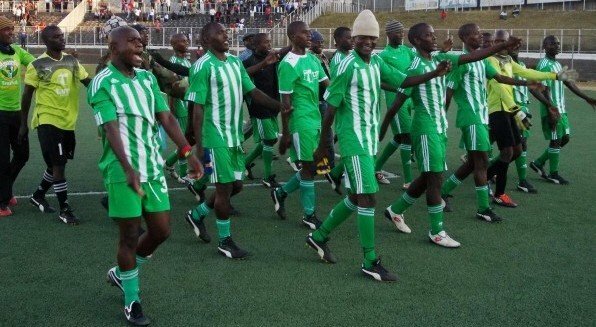 In other Super league match the students from Mzuzu University beat Dedza Young soccer saints 2-1 at the Mzuzu stadium in Mzuzu. It was the students who first took the lead from a spot kick after Wacheta Mwenefumbo was fouled in the box on the 52nd minute of the game. Kondwani Ngoma stepped up for the challenge and he did no mistake but to put the ball into the back of the net. On the 68th minute Dedza Young Soccer leveled the scoreline but Mzuni FC scored another goal through Hudson Milanzi on the 72nd minute of the game. After the final whistle it was Mzuni fc 2-1 Dedza Young soccer and the students have now moved away from the relegation zone and are now on position 11 with 15 points. Congraturations afana apa MZUNI, I feel gd wn teams from Simama league escape a chop in the super league. But Admin plz try to b gvng us names of scorers or atleast mention names of the youngsters as ths motivates thm. Stl u r doing btr bst wishz. Wawa Mzuni wawa. APA APOLISI MWAWATIKITA UKOMA. IMENEYO NDIYO YAKE.